I’ve kept a journal since I was 7. From the age of 13, I also kept a planner. I’m not sure when I started also carrying a notebook &/or sketchbook with me everywhere, but it was sometime before I turned 19. Without fully admitting to my current age, let’s just say it’s been a long time! 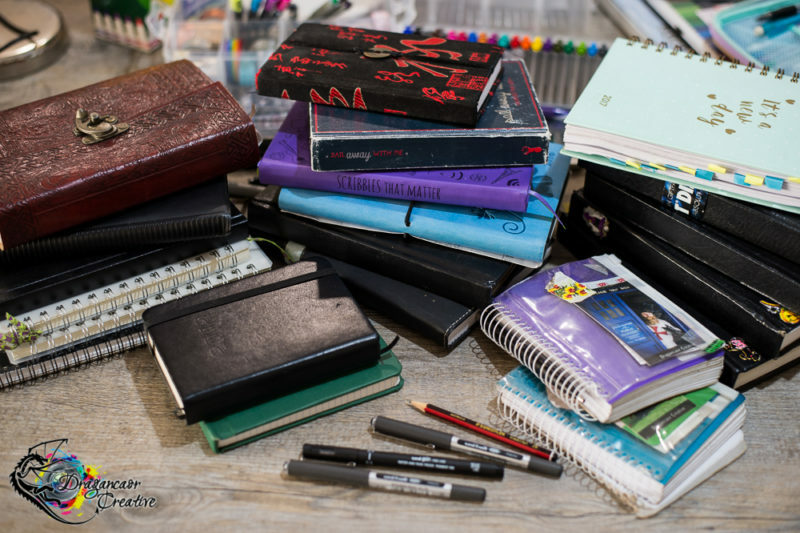 For the last several years I’ve used a day to a page planner, kept a journal of thoughts & sketches, & carried an A6 notebook everywhere. Every year. On top of this, I also have a google calendar that’s linked with my Husbeast’s. These journals are just from the last couple of years. The rest are spread across several archived boxes in storage. 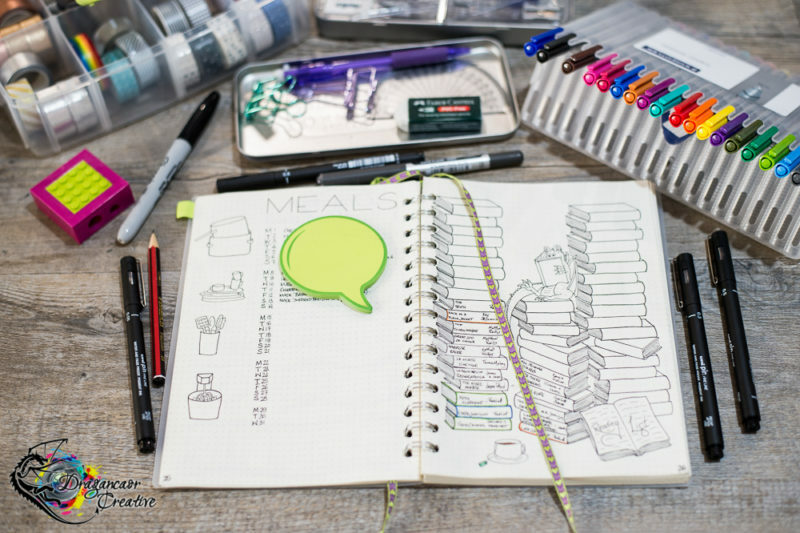 A couple of years back I heard about Bullet Journaling, looked into it… then fell into a rabbit hole of sketch-note journals & those awesome, gorgeous, distressed smash-journals. (Mostly because I made the error of looking on Pinterest & Instagram first, instead of going to the official site where the system is explained.) So instead of starting a bullet journal, I bought another day-to-a-page planner & combined my sketchbook with my journal. That lasted a year before I went back to having a separate sketch book & journal. A friend was asking me early last year why on earth I didn’t Bullet Journal given she thought it was so very much my style. I was neck deep in wedding planning, which was why she was suggesting it, but I didn’t want to start a new system in the middle of that & instead relegated it to my post-wedding pile. I was wrong. In hindsight (which is always 20:20) I should have started the BuJo when Rachel questioned my lack of one. It would have absolutely streamlined my wedding planning & taken a lot of pressure off me while I tried to keep on top of the eleventy billion things it involved. The A3 corkboard, 2 whiteboards, & 12 seater dining table takeover would have been entirely superfluous instead of the necessities they were. So in the close of 2017, instead of my annual pilgrimage to find a day-to-a-page planner that I liked, I went to Officeworks & bought their cheap dot grid notebook. It’s A5, with a spiral binding, semi-clear textured plastic cover, & 90 pages. It would be taking the place of my planner, journal, & sketchbook. Husbeast & I had both thought I’d “waste” a lot of my time setting up the spreads & focusing on making the BuJo instead of using it. We both expected lots of empty space, like my annual planners normally have, & days where I had no idea where the wretched book even was. Within a week, there was a noticeable change in the way I managed my time during the day & in myself. I have spent a lot of time on my spreads. Some of them are simple with minimal detail, while others are colourful, decorative, & fancy. This said, creating these layouts has been a gradual thing, spread across spare moments. Making the most of pencil & jotting ideas in the centre of a page to map out the space before I commit a page to ink (I’m only using the pens I already have but given I do a wee bit of calligraphy, I have a few nice pens in my stash). However, even the bigger spread designs haven’t decreased the things I get done in the day. In fact, this bujo has increased my productivity. An example of two of my [not at all work related] tracking spreads. There are work ones too. Honest. Between the notes, task lists, tracking, & speciality pages, I’ve found I get more done & I take less time to do things. I’m watching my habit tracker’s progression & taking note of what I want to increase or decrease. For example, one of the things I’m hoping of increasing is updating the blog on this site. This makes two this year & I’m still technically on holidays! The true beauty of the Bullet Journal system is its customisable nature. Two days in, I tweaked the signifier for a completed task from Ryder’s X to a Ö because I found the X made me feel like I’d failed on the task. I still use . for a task, > for something that’s migrated, < for a scheduled task, – for a notation, strikethrough for cancelled notes/tasks, & o to mark an event. Getting things noted, tracked, & completed has become a really enjoyable experience, instead of a chore. Two weeks in I’ve got a great routine going, & my body & brain are loving it. All in all, eleven out of ten. Definitely recommend. Thanks for sharing the system, Ryder! * I wrote this a while before I published. To be honest, I wasn’t sure if I would publish this at all to the blog. I’m now ending my third week of using this system in & have made several changes (including a replacement book), but I’ll explain those in another post.